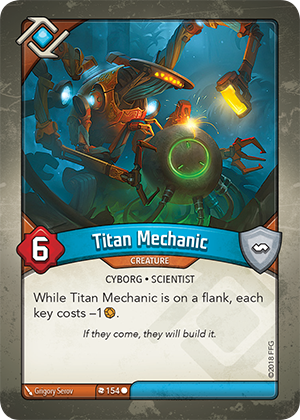 Card Text While Titan Mechanic is on a flank, each key costs –1 . Flavor text If they come, they will build it. If Titan mechanic is the only creature in my battleline, is it considered to be on a flank? Does Titan Mechanic’s ability change the key cost for both players?